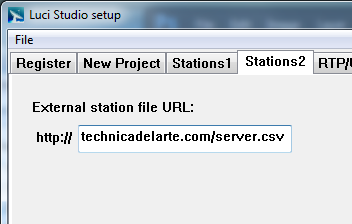 The user can also update the station list with a station-list you can store on any webserver. Format (CSV) is the same as import station-list. Only when a URL is entered the user will see a button called “Update” in the “Choose a Station” window, see image below. The imported stations are appended to the local list from LUCI Studio Setup and cached locally. The list is always updated manually, no automatic update takes place.